On string instruments, players can cause a string to vibrate only in sections by touching it lightly at the appropriate point. This can produce a pure and clear note of a cool, silvery quality. It is called ‘flageolet notes’ or ‘harmonics’. 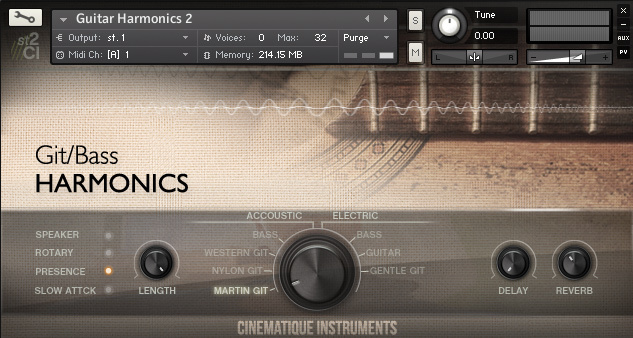 ’Guitar Harmonics’ consists of an assortment of electric and acoustic guitars and basses. We spent a lot of time finding the perfect setup to achieve a warm and realistic sound. In the end we decided to record the guitars tuned in open E with 3 Round Robin variation and particulary several velocity layers – sufficient for our purposes. Besides, each instrument provides a lot of useful scripting tools such as note length control (release and attack), EQ switch, amp simulation, distortion and reverb amount. Summing up these tools enable each instrument to produce a wide spread of sounds such as organic reverse guitars, fragile string notes or warm e-piano tones. Update:In 2015 we updated the Guitar Harmonics and put together all separate patches into one complex patch covered by a brand new GUI. It is now possible to select between all instruments in one patch enriched by several new fx options.